This 11 year old kid took a fall at the swimming pool and knocked out #8. It was out of his mouth for over an hour. It was re-implanted by his general dentist and splinted for some time. 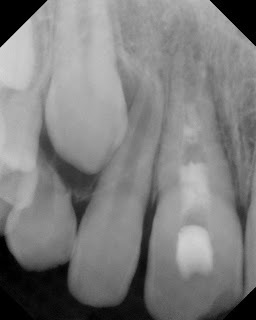 When he came to my office the tooth was still sensitive to pressure, percussion & no response to pulpal testing. I diagnosed it with a necrotic pulp, acute apical periodontitis with immature apex. My recommended treatment was traditional apexification using Ca(OH)2. Apexification is done when the tooth is no longer vital and we are trying to create a calcific barrier at the root end, allowing us to obturate the canal. Ca(OH)2 placed and repeated again 4 months later. After one year of treatment with Ca(OH)2 paste, (you can see the paste resorbs over time) I was concerned that the calcific barrier at the root end had not formed. 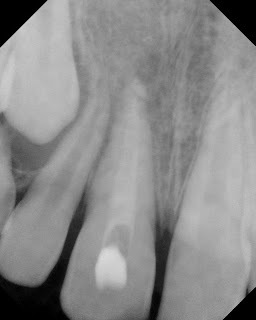 I planned to go in an obturate the whole canal with MTA, but found that a calcific barrier had formed and I was able to obturate the tooth in normal fashion. This is the final film. 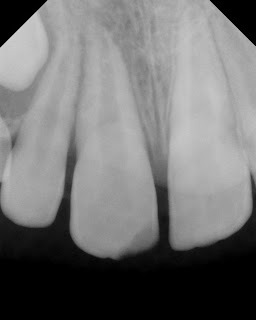 As you can see, once the tooth has been obturated, the apex of the tooth looks completely normal. The next issue that this young guy will have to deal with is the possibility of ankylosis. When the tooth was originally reimplanted, it was fixated for too long of a time. 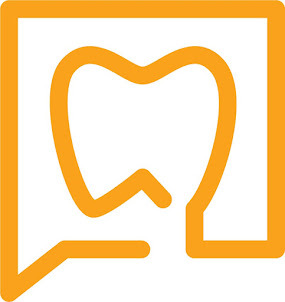 For instructions on treating an avulsed tooth, click here.